Nigerians have been exhibiting an unparalleled patronage of the leading hospitality establishment in Ghana, La Palm Beach Hotel. Every day, particularly at weekends scores of Nigerians fly in to Accra for a pleasurable time at the hotel. Sometimes they come for social engagements like weddings. They even charter aircrafts like pastors of the Redeemed Christian Church of God (RCCG) and their spouses who thronged the hotel recently. As at the end of August, 2004, Nigerian guests accounted for more than 20 percent of business at the hotel, paying at least USD100. It is one of the places to be in Ghana. This enviable position has been attained within a few years of its existence. But it couldn't have been any other way as Golden Beach Hotels Ghana Limited had its eyes trained on such lofty achievements right from the start. With the opening of its first property, La Palm Beach Hotel in May, 1999, it made an unequivocal statement that it had come occupy prominent space in the hospitality business in that country. In November of the same year, it sealed one of the most spectacular business deals acquiring two exquisite resorts in Busua and Elmina in a ground breaking merger that tilted the balance of control in the industry. As much as Golden Beach wants to be seen as a Ghanaian company, 30 percent of the business is owned by Rexol-a company registered in Gibraltar. But apart from two expatriate staff, the entire system is Ghanaian managed. This hotel is one of the establishments that has restored the Ghanaian, (and African) pride; for the efficient and professional manner with which all aspects of the business are handled. The two foreigners are the executive chef and another chef in the Bali Hai, the hotel's specialty restaurant. The configuration of rooms in its three property stands at 144 rooms at La Palm; Elmina has 106 and there are 50 rooms in Busua. There are prospects to increase the number of rooms in Busua to 75 by mid 2005. The arrangement of the rooms are in three categories-royal and presidential suites and standard rooms. La Palm features four restaurants including the continental, Fulla Pool Terrace, the Bali Hai and the Ghanaian Village. The last spot presents a spectacle on its own, with architecture presented in traditional African style and the cuisine kept within the confines of local delicacies as much as possible. Sundays at the Ghanaian Village comes with a fantastic presentation of a musical group known as Roots of Africa. Populated by musicians from various in the West African sub-region, Roots is led by a Nigerian, Prince Ade. In keeping with the village philosophy their presentation is left at strictly acoustic, without use of any electronic equipment. 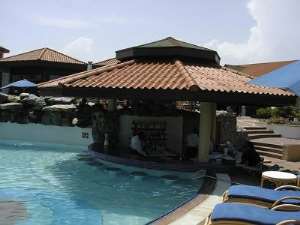 Just sitting at the Ghanaian Village of the La Palm hotel, particularly on Sundays holds a thrill that is unforgettable. The typical African décor, the music and the Atlantic rolling freely a few metres away brings home a sense of liberty that is unparalleled. Jean Adwoa Donkoh who holds the hotel's brief for marketing and public relations was forthright with the occupancy rate as at September, 2004; for La Palm it was 86 percent. The occupancy for Elmina was 46 percent, while Busua had an occupancy rate of 56 percent. She attributed the higher guest traffic at La Palm to the fact that it is located in the city and also offers a wider spectrum of leisure activities. To give customers a broader and well rounded experience, Golden Beach Hotels offers a package that allows the guest to stay one day in La Palm and two days each in El mina and Busua. The unfortunate circumstances that Ghana Airways has found itself at this time has affected the hotel's resolve to sue the airline in its partnership bid to promote local tourism. But this has deterred it from continuing with a loyalty programme that will enable frequent guests to earn points that will entitle them to some kind of bonus or reward. GBH has tactically refrained from promoting any links with an international hotel group, preferring instead to enter into discussions with high ranking hotels in the West Africa sub-region. The intention is to have an exchange arrangement, enabling its staff to be exposed to another environment. Similar partnership alliances have been entered into with hotels in South Africa for training purposes. The list of famous American entertainment personalities like Roger Moore (007), Stevie Wonder and Will Smith; plus presidents of many African countries including Nigeria's Olusegun Obasanjo, ex- American presidents Jimmy Carter and Bill Clinton and UN Secretary General, Kofi Annan is quite long and impressive. Patronage from these famous persons has brought home the urgency of adding more rooms to the flagship property-La Palm Beach Hotel. At least, 100 rooms will be added in the next two years. As the hotel always aims to bring something new to surprise its guests, its immediate goal is to increase the leisure options for children. A more engaging playground is being developed for them. The GBH job is the first time that Donkoh would work in the hospitality industry. Previously, she had lived and worked in the US for 17 years. She came home in April, 1999, one month before the hotel was opened. One of the most challenging things for her has been how that one can work in a hotel and be completely absorbed without knowing what goes on in the back. But her love for the job has been a sweet tonic, taking her to new levels of understanding and involvement. There is no doubt that Cross River State is being increasingly referred to as the leading tourist-friendly state in Nigeria. Governor Donald Duke has left nothing to chance when it comes to his resolve to transform the state to a tourist haven. He puts his money where his mouth. Every material that is needed for this project is being meticulously procured. But for a while Duke had only an adhoc assemblage of men executing this all important assignment. Happily, that is in the past. Having gone through a thorough process of shopping for some of the best hands in the business, a solid platform has been put in place with the establishment of the Cross River State Tourism Bureau (CRSTB). The emergence of this body has brought about a few re-alignment of personnel. For instance, one of Duke's special assistant, Mr. Gabe Onah has had tourism deleted from his brief. Although, Onah is still on call to carry out certain assignments relating to tourism, his primary focus now is culture. What is even more instructive about the CRSTB is the crop of vibrant young men and women put together to champion Duke's tourism dream. This people have been told in clear terms that Cross River State must become the preferred place to be in West Africa. One of those working on this pioneering team is Dr. Paul Adalikwu, Director of Administration and Strategic Planning. The management team which was put together in April of this year, has four directors, with a managing director at the head. The marketing plan is to take the kind of aggressive drive witnessed in Lagos and Abuja to the eastern and south south states of Enugu and Port Harcourt respectively. Adalikwu who spoke with this reporter in Accra, Ghana said Cross River will now be marketed as a composite destination comprising the Agbokim waterfall, Nkarazi monolith, the Kwa falls, and the Marina Beach Resort to mention a few. The approach, according to Adalikwu is to expose tourists to other attractions in the state, as many of them have only heard of or been privileged to visit the state's premier site-Obudu Ranch Resort. One of the most profound programmes that the CRSTB is about to carry out is create a synergy between stakeholders in the industry and the state government. Towards this end, a stakeholders' forum is being planned. Adalikwu who also doubles as part-time teacher to Phd students of the Univerisity of Calabar brings to the job a vast experience of living and working in the United States of America for close to 30 years.